This essay explores the 2016 election using 1964 for comparison. The central theme is that 1964 set the context for subsequent presidential elections. Issues and public policy revolved around the standards set by the 1964 converting election. Both race and religion played a role in the 1964 converting election that redefined the Democratic Party as the liberal political party for the nation, and the Republican as its conservative counterpart. This established a political regime that endures until the present day, but its endurance has had deleterious consequences for the discussion of new proposals. Change happens slowly and piecemeal. Both parties maintain high levels of spending as politics has been reduced to administration, a technocracy rather than representative democracy. The resulting pressures and frustrations manifest themselves with increasing frequency in the political system. The tumultuous 2016 campaign is the latest manifestation of this dissatisfaction among voters. Given the peculiarities of 2016, are we on the verge of a historic realignment, one that may set a similar standard for a generation?. From professional pundits to casual observers, there are deep concerns about the state of American society and profound doubts about its future. Political cynicism is ascendant–and yet, the desire for politicians to “do something” remains. What role can public policy have in addressing the largest social problems and their causes? And beyond public policy, what are the potentially effective means in terms of social institutions, including the Church? Although public policy offers some promise, its usefulness is generally exaggerated. Its costs are typically subtle and often ignored. Knowledge of consequences and trade-offs is insufficient, and the motives of political agents are less than pure. And many dilemmas, by their nature, cannot be ably addressed by politics and policy. In contrast, a resurgence in civil society–particularly the Church–holds more promise. Even in a time of potential “exile,” the Church is called to pursue the holistic welfare of society and enhance the common good. Toyohiko Kagawa, a Japanese evangelist and social activist, preached and practiced cooperatives as integral to the nature and mission of the Christian church. Using pulpit, podium, and pen, Kagawa blended a call for heart conversion with a call to establish Christian cooperatives. When Kagawa stumped America promoting this vision in 1936, theologian Reinhold Niebuhr expressed reservations. Unlike Kagawa, Niebuhr saw cooperatives as no panacea, though lending his support to an experimental cooperative in the U.S. that was doomed to fail. Kagawa faced opposition from within the church, but shared the podium with Billy Graham during the young evangelist’s Tokyo crusade in 1956. This essay draws from Kagawa’s vision and Niebuhr’s critique insights for the church today: the need for visions without illusions, the difficulty of linking church and cooperatives, and the value of reforming the church’s approach to mission through reflection and a deeper analysis of the human condition. In the past few decades, a lot has changed in the world. There is now a global dimension to every societal value. 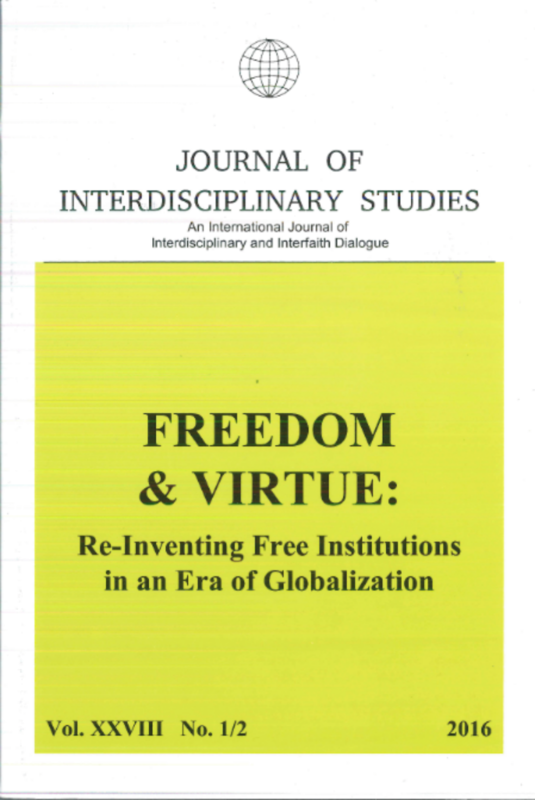 Globalization has unlocked the local and national perceptions to a broader outlook of an interconnected and interdependent world. People are mingling in the world like never before. But these come with new challenges, new social regulations and controls that require adoption of new values, all of which foist on people competing and often incompatible demands between work and family, and have led to the erosion of pivotal values that hitherto bonded families together. Today, marriages are few, divorces are many, and the number of children born to unmarried, single parents has skyrocketed, with shocking social consequences. This essay unravels the apparent chaos in marital and family ethics arising from an unhindered freedom of choice in a globalized era, and proposes a rediscovery of sound traditional family values as a solution. This essay addresses the problem of the decline of interest in the Liberal and Fine Arts, and the humanities, East and West, accompanied by a reductionist understanding of reality and life. That reductionism results in a trivialization and brutalization of culture. The essay considers three prominent modes of understanding: Scientism, Relationalism, and Wisdom-seeking. A scientistic relationalism is anti-intellectual and anti-cultural. In contrast, a Wisdom-seeking relationalism affirms human dignity, and is grounded in a qualitative ontology necessary to an intellectual and moral life. The historical turning-point in the West in which the intellectual and practical pursuit of Wisdom was replaced by a scientistic relationalism is personified by the contrasts between St. Anselm of Canterbury and Peter Abelard. This essay is in response to Arthur Pontynen’s dissection of the ills of Western culture and campaign to revitalize the liberal and fine arts. It endeavors to critically examine Pontynen’s causal basis for the crisis and to elevate and elucidate his sub-level spiritual dimension of the issues, raising it to a central emphasis. For many a serious scholar, criticism of a norm comes sometimes too easily, while constructive criticism with a solution-oriented approach is more daunting. Most readers are likely to agree with Pontynen that our social and intellectual structures in the West, from the perspective of the twenty-first century looking back across history, seem to have failed culture and civilization in the pursuit of truth and wisdom. It is incumbent upon all, especially Christian scholars, to seek redress of the prevailing imbalance favoring a cynical and nihilistic conclusion that nothing has meaning and that humanity is doomed to random chaos. The purported crisis and opportunity in liberal education may be approached via a reconsideration of the arts in liberal arts education. The advantage of such a view is that proponents of humanistic liberal education could speak in their own terms, while incorporating in a systematic way studies of ancient and modern liberal arts, addressing public questions of the value and substance of a liberal education. A plausible issue for consideration is whether the “arts” can address a crisis, its purported causes and solutions, and the key role the humanities may have in building a renewed liberal arts education. At stake in the classroom is the realization of the possibilities, the intellectual freedom, which humans make for themselves in artistic making. This freedom differs from, but is complementary to, political freedom, the loadstone of standard liberal education defenses, because it is based in innovations and inventions of the arts and sciences, not in constitutions or politics of democracy. Enjoy Your Copy: Order Today!